The San Juan River, as it flows in Central America, demarcates a border between Nicaragua and Costa Rica. This border has been a source of contention between the two states for years. The situation around the border issue is already tense for both governments as an issue of national pride. Armed forces have been mobilized on both sides of the border in recent years yet have avoided armed conflict, redirecting new attention to an old dispute. Added stresses caused by climate change, such as exteme droughts which could cause water scarcity in the San Juan River Basin, only exacerbate the problem. With such competition for available water resources, these two governments may decide that armed conflict is worth the risk. This case study looks at the border dispute between Nicaragua and Costa Rica over the San Juan River. The San Juan River acts as the eastern border between southern Nicaragua and northern Costa Rica. This border is demarcated by the path of the San Juan River east of Lake Nicaragua. Despite the fact that these two neighboring states have typically been friendly, this border has not always been a source of such amiable relations. Both Nicaragua and Costa Rica claim rights to the San Juan River, and though they do not claim equal rights, they have never been able to fully agree. Costa Rica claims more rights to the San Juan than Nicaragua is willing to grant based on the 1858 Canas-Jerez treaty. This treaty made the San Juan River the permanent border between both states. The main tenants of the treaty stated the following: Nicaragua would "have exclusive dominion and the highest sovereignty over the water of the San Juan", Costa Rica would be given "perpetual rights of free navigation" on the San Juan "for the purpose of commerce", and Nicaragua could not enter into unilateral negotiations concerning a canal project without consulting Costa Rica beforehand. Clearly the Canas-Jerez treaty set the stage for opposing interpretations of rights to the San Juan River. Nicaragua believes that it is the rightful owner of the San Juan as laid out in the treaty yet Costa Rica also believes that it has rights to the same water. Based upon the ambiguity of the treaty and the disagreement between both governments, the Untied States was brought in to arbitrate in 1888. As a result, the Canas-Jerez treaty was reaffirmed in the Cleveland award but specified that Costa Rica's right to navigation was onlyfor ships with cargo consisting of commercial merchandise and did not include carrying arms. The Cleveland award did clear up some of the ambiguity of the Canas-Jerez treaty, but did not even begin to bring Nicaragua and Costa Rica to the same table regarding interpretations of river rights alltogether. Over the next 100 years or so, the San Juan River would remain a point of discontent between both governments. In the late 19th and early 20th century, Costa Rica would refuse to concede to canal projects which brought resentment from the Nicaraguan government which desperately wanted a canal through the San Juan route. Then in the 1940's Costa Rica undertook the unilateral dredging of the Colorado River, a tributary of the San Juan River which runs through Costa Rica. This dredging completely changed the flow of water at the fork of the San Juan and the Colorado. Before this decision to dredge in the Colorado, the majority of the water at the fork of these two rivers would continue to flow to the north along the route of the San Juan River. Today, after the dredging process, the fork between the two rivers has shifted to widen at the mouth of the Colorado, thus diverting more water into this tributary of the San Juan as opposed to its natural course continuing down the San Juan River itself. This water is now directed into Costa Rican territory and has caused the last 37 kilometers of the San Juan River in Nicaragua to become virtually unnavigable as it dries out and clogs with silt and other sediment. This drying of the San Juan River has caused it to shift northward further and further into Nicaraguan territory. Since the officially demarcated border is the flow of the San Juan River, Nicaragua is not only losing a valuable water resource, but is also effectively losing territory to Costa Rica as an effect of its unilateral dredging. The fork of the San Juan River and the Colorado River in the 19th century, pre-dredge. Water is flowing on its natural course down the San Juan River. The fork of the San Juan River and the Colorado River in the 20th century, post-dredge. Water is being diverted from the natural flow of the San Juan River into the Colorado River. Beginning in 2010, Nicaragua set on its own path to dredge the San Juan River in order to restore the flow of water back to its original course and regain its water and its land. The Costa Rican government has openly opposed the dredging, which is conveniently ignoring the fact that they did essentially the same thing 60 years prior. Costa Rica claims that it has concerns about the potential environmental impacts of the dredging, especially since a large portion of the Colorado River runs through Barra del Colorado national wildlife refuge. They claim that the wildlife here, which has now become accustomed to and dependent on the increased waterflow would be adversely affected. The Nicaraguan dredging project, known as the Sovereignty, was temporarily halted due to political pressures but has since been restarted and gained Nicaraguan military backing. In October 2010, this dredging project nearly brought the border dispute to blows in armed conflict. Nicaraguan troops were seen, via aerial photographs, to be occupying Isla Calero as a part of the dredging project which is considered to be Costa Rican national territory. In response, Costa Rica sent in its police force, La Fuerza Publica, to the town of Barra del Colorado in the northeastern corner of Costa Rica, which is the closest town to Isla Calero. Costa Rica lacks an official army and often cites this fact as a reason to use diplomatic means in solving its disputes and often portrays itself as a non-aggressor or victim. 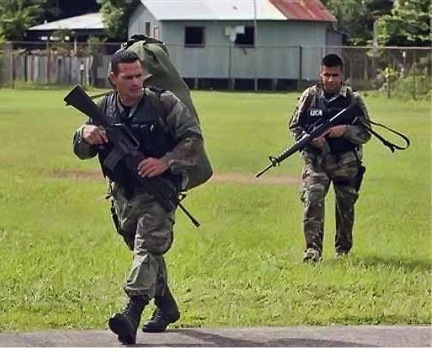 However, the Costa Rican government has a budget of approximately $240 million for the armed police force that it does have, which is almost five times more money than the Nicaraguan government budgets for its army. In fact, if one did not know that Costa Rica had no army, it might mistake the police force, pictured to the left, for military personnel. These well trained and well equipped "police officers" almost clashed with the Nicaraguan army but luckily the Nicaraguans pulled their own men from Isla Calero before this became a reality. The degree of involvement of the armed forces in this narrative may seem excessive. But this is a direct result of the nationalism that surrounds such border disputes. Both Nicaragua and Costa Rica have had much political instability. In Nicaragua, one of the poorest countries in the America's, almost half of the population lives below the povery line. Its history since independence has been plagued with corruption, US interference, and military dictatorships. Costa Rica has been a poor state since its colonial days and about 30% of its population lives below the poverty line. Additionally, its coffee economy has stratified society and marginalized much of the population. Due to these, and several other factors, governments in both states must constantly work to maintain their legitimacy. Making the border dispute a nationalist issue helps each government maintain its legitimacy by working to gain more water or land for its people. Without the unstable political climates, these two governments would have no reason to nationalize their border disagreement. But instead, it becomes an issue of national pride and compromise is simply not a viable option. Rica via the San Juan River border. This immigration takes place for several reasons but mostly is due to the political instability of Nicaragua and the ease of illegal immigration into Costa Rica. This process is easy for Nicaraguans because Costa Rica simply lacks the resources to control the flow of people across the border. Since the 1970s, there has been a nearly constant flow of illegal Nicaraguan immigrants which has become a source of hostility from Costa Ricans towards Nicaraguans in the region. Much of this xenophobic hostility stems from the widespread stereotypes of Nicaraguans as violent and crime ridden. It also stems from the increase in job competition that Nicaraguans bring to northern Costa Rica. In the 1990's, public opinion in Costa Rica showed that 56% of Costa Ricans opposed the presence of Nicaraguans in their country. 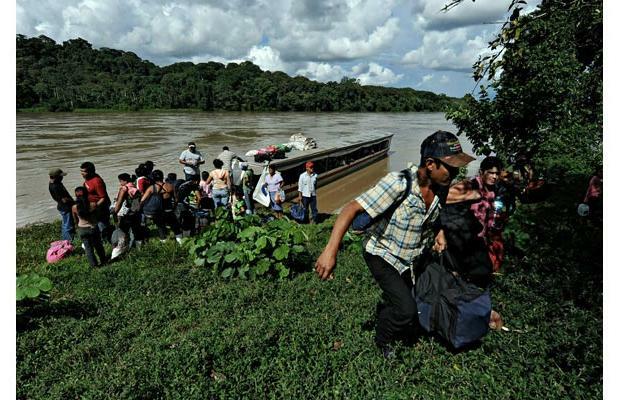 Again, the problem of illegal immigration is framed in nationalist terms to grant legitimacy to the Costa Rican government and to provide popular support for the regime. This creates an "us vs. them" mindset between Costa Ricans and Nicaraguans which exacerbates border tension. In addition to the potential reasons for conflict stated above, it is predicted that some of the most serious effects of climate change will be felt in Central America and thus in this border region. Not only will extreme climatic changes be felt here, but they will be felt very soon. Given the already tense nature of the San Juan region and its role as an international border, the coming effects of climate change such as drought, flooding, and resource competition, will only exacerbate these tensions. It could be the very spark needed to take this hostile political climate and set it on fire. The dispute between Nicaragua and Costa Rica over the San Juan River began back in 1821 when they were both granted independence from Spain. Costa Rica annexed two regions of Nicaragua, Nicoya and Guanacaste, shortly after independence which changed the existing border. Finally in 1858 the Canas-Jerez Treaty initiated a legal disagreement between the states. The disagreement began over Costa Rica's rights to navigate the San Juan, and has escalated to defining the actual location of the San Juan River and potentially the resulting international border. This dispute has extended into the 21st century where it came close to armed conflict as recently as 2010, which classifies it as ongoing. 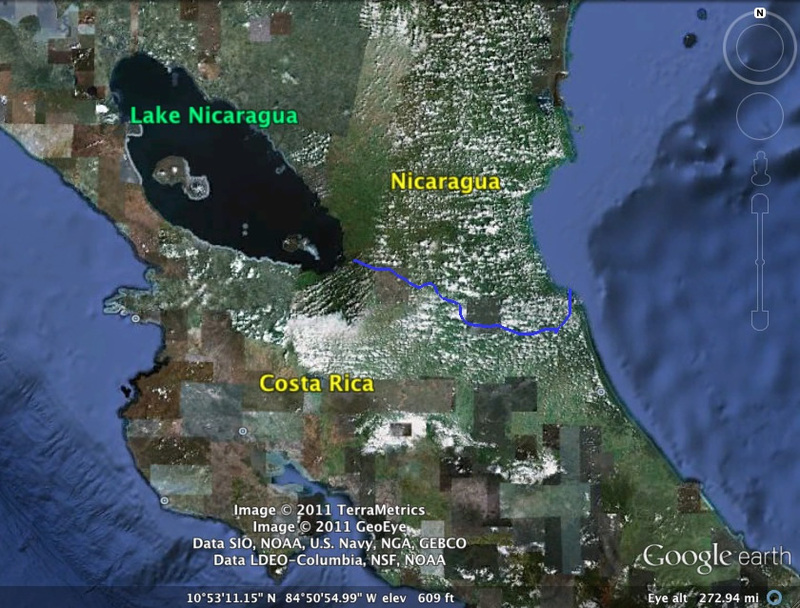 The main location of this dispute is the eastern portion of the border between Nicaragua and Costa Rica to the east of Lake Nicaragua. This includes land regions in Nicaragua from San Carlos in the West to San Juan Del Norte in the East. And land regions in Costa Rica from Los Chiles to Colorado. The chance of a conflict erupting that would involve the entirety of either state is unlikely and thus the location is restricted to the border region. The basic environmental problem is rapid climate change. Central America is expected to have dramatic effects from the current rate of climate change. Such effects include sea level rise, salinisation, extreme drought, and extreme flooding. Unfortunately the predictions and forecasting of such events is not much more specific. Different regions may experience severe droughts while others suffer from intense flooding but which effects will be felt in which region is not known. Despite this uncertainty, the International Panel on Climate Change (IPCC) has forecasted changes in both precipitation and temperature in this region to the best of its ability. 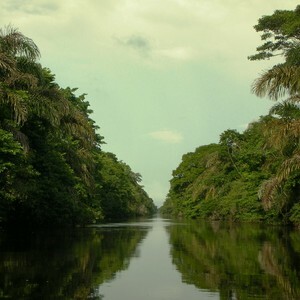 According to the IPCC's Fourth Assessment Report relesed in 2007, Central America is supposed to experience increases in temperature between 1 degree Celsius and 6.6 degrees Celsius by the year 2080, depending on the season. Precipitation changes by the year 2080 are predicted to be anywhere between a 30% decrease and an 8% increase. These forecasts by the IPCC, which is considered the premiere climate change organization today, illustrate the uncertainty surrounding climate change and its effects in Central America. The temperature in Costa Rica and Nicaragua will increase, it is only the scale of this increase that is not certain. On the other hand, the San Juan River and its basin could be receiving 30% less precipitation than it did in 2007 or as much as 8% more. Yet since the temperature will obviously be increasing and the forecast seems to favor decreased precipitation, the remainder of this analysis will assume drought to be the most important obstacle in the San Juan border region. The habitat of both Nicaragua and Costa Rica, as well as their shared border region, is tropical. It has a wet season and a dry season like most tropical habitats. Most of the land area around the border however, is specifically forest. These forests feed off of the San Juan River and drought could be potentially devastating. The act and harm sites will be the San Juan River basin and civilian populations affected by the severe droughts. These climate change induced environmental changes will reduce the water supply to both Costa Rican and Nicaraguan populations who rely on the San Juan River Basin. Populations in this area will experience water scarcity and increased competition for remaining water resources. Currently, the conflict remains dormant. No physical violence or clash of armed forces is occuring. But Central America, and hence both Nicaragua and Costa Rica, is located in a potential "Hot War" zone due to the predicted effects of climate change. This makes the region more prone to potential conflict and very important to watch in the future. No fatalities have been reported due to the border dispute. While military personnel have had been deployed, armed conflict has been avoided for at least the past 100 years. The majority of this dispute is non-violent. This causal loop diagram shows the links between climate change and potential conflict around the Nicaragua/Costa Rica border. Climate change in this region is predicted to reduce precipitation, while also increasing temperatures. Increased climate change, will cause increased cases of extreme drought. This drought will in turn have two effects: to cause more population displacement for people who can no longer live off of the land, and to cause a reduction in freshwater resources. Both a loss of water source and the population movement already in place will cause more Nicaraguans to emigrate to Costa Rica since most of the San Juan is diverted into Costa Rican territory. This movement of peoples could be legal but will most likely be illegal given established patterns of immigration across the border. Adding more people to the northern region of Costa Rica will increase resource competition between already hostil groups. The Costa Rican government could plausibly to crack down on Nicaraguan illegals to the likely dismay of the Nicaraguan government. With national pride in the way, and a valuable water resource at stake, conflict is likely to erupt. In order to avoid this outcome, the actions should come from the inter-governmental level. The governments of both Nicaragua and Costa Rica need to stop defining this border dispute in nationalist terms and instead work on collaborative projects to protect the San Juan River and its basin from climate change. The populations of each state would need to accept this cooperation and also understand that their xenophobic tendencies only make the problem worse. A bilateral agreement and/or project, with the support of Nicaraguan and Costa Rican citizens, to put aside differences and protect a valuable resource could mitigate the chance of nationalist conflict. - "San Juan River -- Border dispute between Costa Rica and Nicaragua"
- "The Nicaragua-Costa Rica Border Dispute - A Symptom of 'Tico' Decline? - "The Rio San Juan: Source of Conflicts and Nationalism"
- "Nicaragua's President Accuses Costa Rica of Trying to Steal Rio San Juan"
- "The Truths that Costa Rica Hides"
- "Experience Nicaragua - History"
- "The Political Formula of Costa Rica"
- "Climate Change 2007: Working Group II: Impacts, Adaptation, and Vulnerability"
- "Climate Change and the World's River Basins: Anticipating Management Options"